Convert your audio books to MP3 or AAC. Is there a better alternative to Ondesoft AudioBook Converter? Is Ondesoft AudioBook Converter really the best app in Audio category? Will Ondesoft AudioBook Converter work good on macOS 10.13.4? Ondesoft AudioBook Converter is an AA converter that can batch convert purchased Audio books or AA flies from iTunes or Audible on OS X to MP3 or AAC format. Then DRM protections on audio book will be removed. The conversion with CD output quality is at up to 16x speeds! Convert purchased audio book playable on iTunes - Any purchased audio books from iTunes or Audible, if it could be played on iTunes, can be unlocked and converted to MP3 or AAC, AC3, AIFF, AU, FLAC, M4A, M4R, and MKA. Convert Audible aa to MP3 to play anywhere - Remove DRM of audio books or AA files from iTunes audiobook library to MP3 or AAC format and enjoy it on iPhone 4S, iPod touch, iPad, Sony PSP, smart phone, MP3 player, laptop, portable PC, etc. Remove DRM protection - Designed as an .aa converter and audio book DRM remover, Ondesoft AudioBook Converter can remove copy-protection (DRM) from audio books and convert into unprotected MP3 or AAC format. 16X conversion speed - Ondesoft AudioBook Converter can encode and convert audible aa files at speeds of up to 16X. Preserve ID tags - Onde purchased AudioBook Converter will keep ID tags for the newly converted MP3 or AAC files files. Output MP3 or AAC files with CD quality - Preset output options like codeck, bitrate, sample rate, and channels to get customized MP3 or AAC files with CD quality. Batch-convert DRM audiobooks - Batch conversion allows users to select multiple audio book files to convert with just a single button. 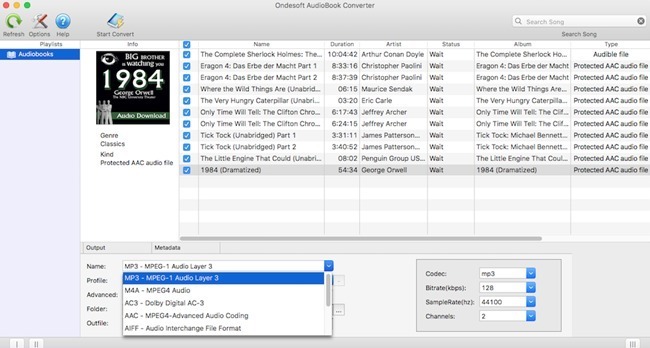 Silent recording - Ondesoft AudioBook Converter works in the background when removing DRM from purchased audio books. Quick access to iTunes folder - Loading the user's iTunes' folders automatically makes for a quick and seamless user experience. Unlimited converting times - Convert AA files as many times as you like with Ondesoft AudioBook Converter without limitation of one-time burning to disc on each authorized Mac.